See Eugenio Maria de Hostos. Elda Perez- Mejia committed to the values of her parents: love of education and civic duty, when she found her passion in education with MicroSociety. She was a 4th grade teacher at Eugenio Maria de Hostos MicroSociety School in Yonkers, New York in 1996 and never looked back. 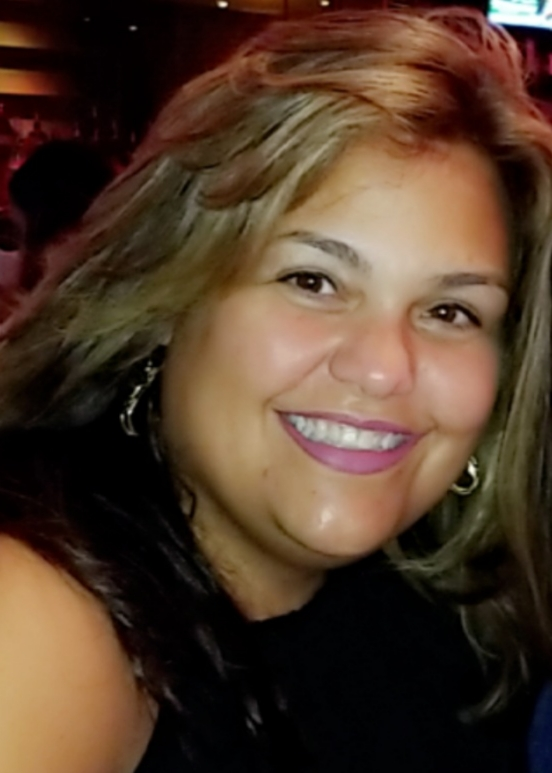 Although Mrs. Perez-Mejia held many subsequent positions over the years including Title VII facilitator, Reading First Bilingual Literacy Coach for Early Childhood, Assistant Director of the Bilingual Department, ESL and Foreign Language Departments, she returned to Eugenia Maria de Hostos in 2009 as the school’s Principal and when she did, she brought back MicroSociety. Scores began to rise immediately and the school has remained in Good Standing ever since. 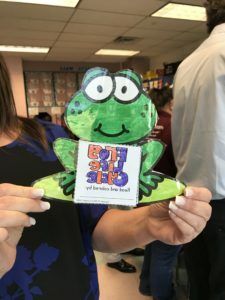 Ms. Mejia continues to share her parents’ ideals with her students, particularly through Hostos Cares initiatives such as Pennies for Patients. Although 90% of the school population is considered low socio economically disadvantaged, students engage in active fundraising and recently raised over $4,000 to help children suffering from Leukemia. Helping students understand how their active participation can impact and change lives for the better in their own communities is a cornerstone of the Hostos MicroSociety program she has created. Ms. Mejia holds a B.S. in Elementary Education from Pace University, M.S. in Bilingual Education from Long Island University and M.A. in Supervision from Fordham University. She was Yonkers Public Schools Administrator of the Year 2013-2014. 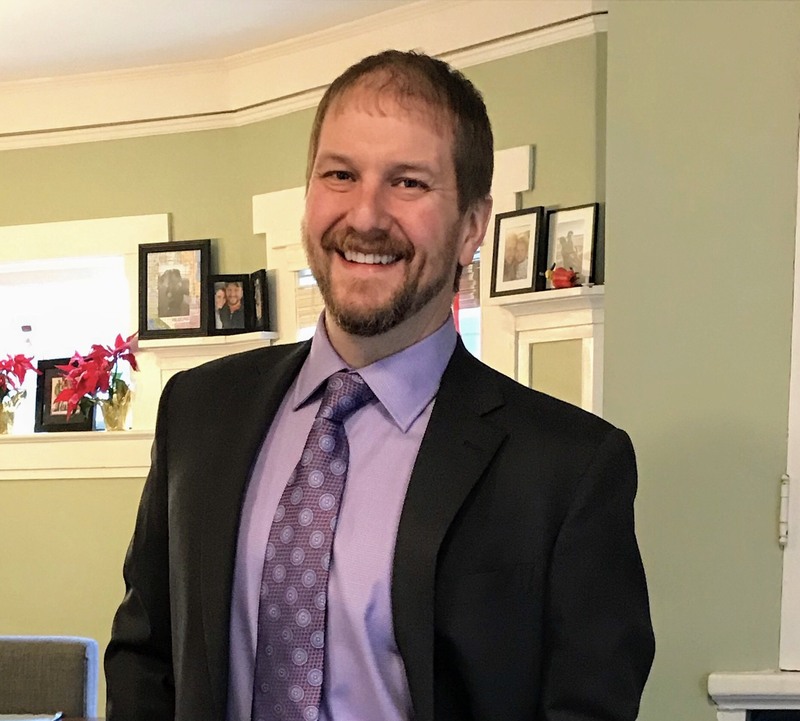 With years of experience as a secondary education administrator, Jeremy Rynders joined the Eugenio Maria de Hostos Community as Assistant Principal late last year. 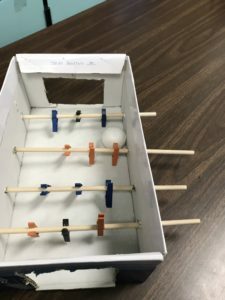 He is still relatively new to the MicroSociety model but is excited to find there the independence, ownership, and leadership he sought growing and maturing in his students. Already he is thinking of ways to expand cooking and the outdoors, his two loves, into the thriving society of his new home. Originally from Texas, Mr. Rynders came to Hostos more recently from New York City, where he taught Biology and was the Assistant Principal at Bronx Leadership Academy II High School from 2006-2017. With impressive credentials in operations, he was then tapped as the Assistant Principal of Stuyvesant High School in Lower Manhattan. Ultimately, he changed course and took the plunge to join the K-8 Hostos School, one of the nation’s longest running MicroSociety schools and we are pleased he did. Celia Stowell manages to hold two jobs at Eugenio Maria de Hostos. She is an English as a New Language teacher and the school’s MicroSociety coordinator. 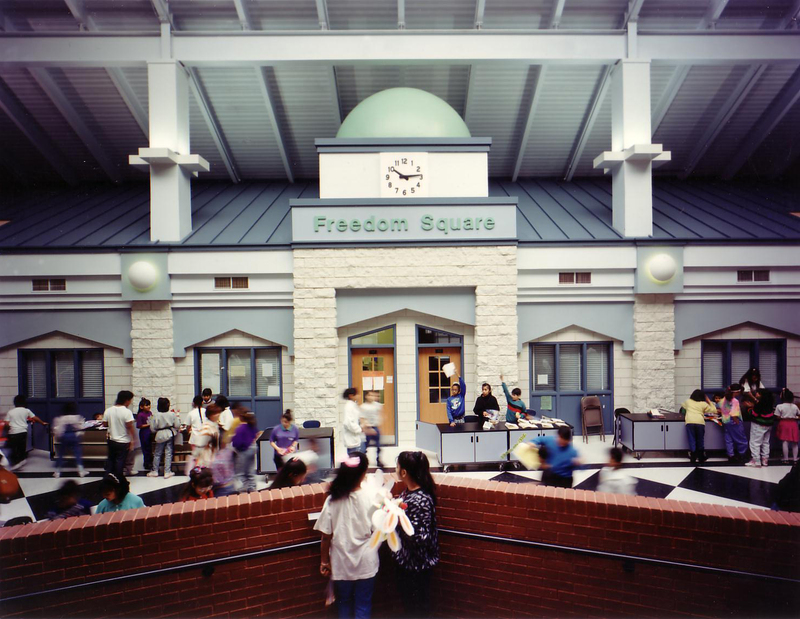 The latter role is also bifurcated as she concentrates her efforts on the coordination of the school’s two MicroSociety programs: the Pre-Kindergarten mini-Micro, home to the Kiddieville neighborhood, and Micro City, the more traditional MicroSociety experience for students in grades 1-6. This wonder woman earned her undergraduate degree and Master degrees in Education, is certified in ESOL, Reading and Administration. If you ever doubted that the REALLY young can LOVE ENGINEERING, you need to meet Ms. Rivera. From the moment she stepped into Eugenio Maria de hostos six years ago, she became part of the MicroSociety Kiddieville Leadership Team for the younger set to help her better understand the inner workings of Micro and to become steeped in its philosophy. 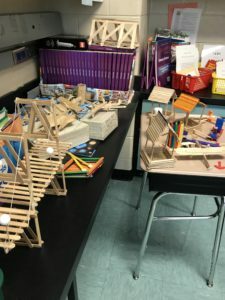 Although she began her Life In Micro as facilitator to Book Hooks, she quickly observed that her kids could do far more than she ever imagined so with her love of everything STEAM, she took the plunge and combined her loves: STEAM and working with PRE-K and the Mini Micro Engineering venture “Tot-Builders” was born. In this lively, engaging and colorful classroom, four year olds follow the Engineering Design Process to build, create and play with everything from a stack-able, multi-car larger-than-life train set to wind turbines. 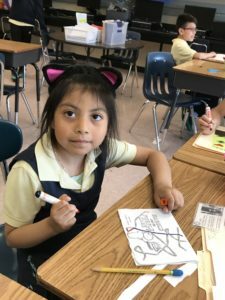 After all of the organized chaos of her classroom, It's no wonder that Ms. Rivera likes to walk and read in her spare time. 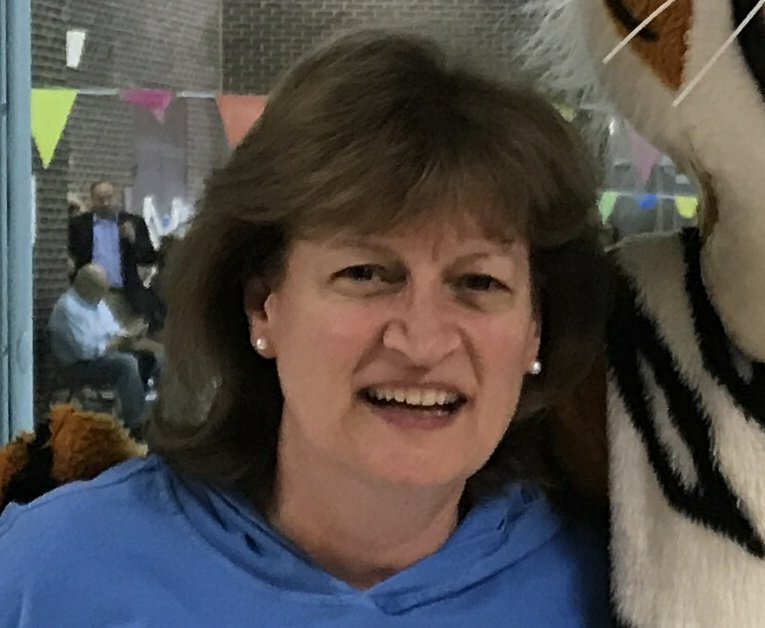 Although she has been a teacher for 16 years, Kelly Ficarrotta thinks her life rocks! Where else could she frequently change jobs and never leave her home base? 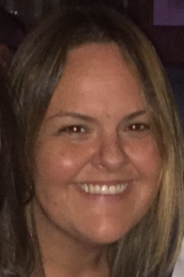 For the past 14 years of her teaching tenure, Kelly has lived her life away from home at the Eugenio Maria de Hostos School teaching Kinder, 1st, 2nd, 4th, 6th, 7th and 8th grade citizens. 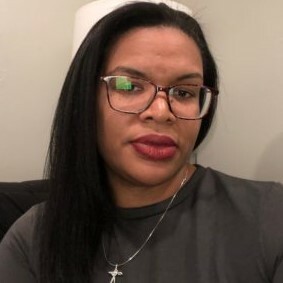 She has facilitated a wide range of Micro ventures, including the Hostos Travel Agency where she worked with kids of all grades for several years, but like her colleague, Yocaira Rivera, she decided to join the House of STEAM. Now she facilitates the Hostos Science Center, working alongside her pre-k and kindergarten students, including, Johnny, her star employee. With his autism, Johnny never said a word and was intimidated by his peers. But that was before. Now he arrives at work on time every day and the staff of HSC are fascinated to learn what Johnny already knows. Hostos Cares creates jobs that minister to the homeless. Parents love what MicroSociety is instilling in their kids. performance remained consistent through a change in principal and through two major changes in New York’s testing system. 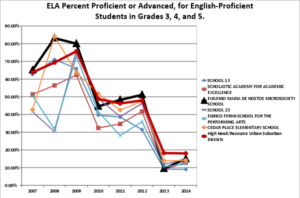 See Graph 1. While the new Common Core tests have proven to be extremely difficult for Limited English Proficient (LEP) students, in both years since the test was implemented LEP students at Hostos outscored LEP students at every one of the five Comparison schools and students in the statewide comparison group. 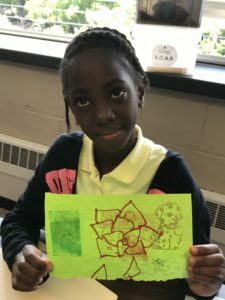 In five of the seven preceding years, LEP students at Hostos had outscored the statewide LEP comparison group and outscored LEP students in either four or five of the five comparison schools. 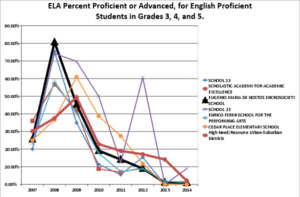 See Graph 2. 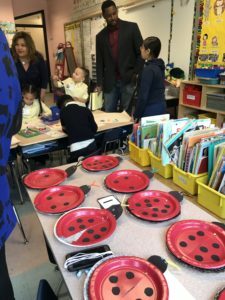 The Eugenio Maria de Hostos Microsociety School did not appears to have a consistent impact on students’ ELA achievement as measured by New York tests. For both English Proficient students and Limited English Proficient students Hostos sometimes scored at or near the top of the group of comparison schools, sometimes at or near the bottom, and sometimes in the middle. Hostos students did better than students in the satewide comparison group in some years and worse in other years. See Graphs 3 and 4. 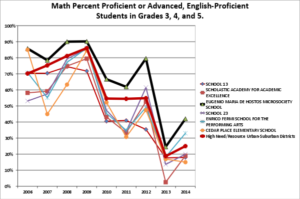 Explanation of Graphs In each graph, the thick black line represents Hostos students. 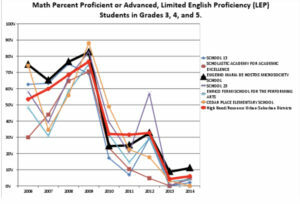 The thick red line represents students in the statewide comparison group. The thin multicolored lines represent students from the five comparison schools.